Current sociology of knowledge tends to take for granted Robert K. Merton’s theory of cumulative advantage: successful ideas bring recognition to their authors, successful authors have their ideas recognized more easily than unknown ones. This article argues that this theory should be revised via the introduction of the differential between the status of an idea and that of its creator: when an idea is more important than its creator, the latter becomes identified with the former, and this will hinder recognition of the intellectual’s new ideas as they differ from old ones in their content or style. Robert N. Bellah’s performance during the “civil religion debate” of the 1970s is reconstructed as an example of how this mechanism may work. Implications for further research are considered in the concluding section. Earlier versions of this article were presented at the 38th International Institute of Sociology Annual Meeting, Budapest, June 2008, and the Urbino Seminar in Critical Theory, July 2008. The author would like to thank Robert Bellah, Matteo Bianchin, René Capovin, Harry M. Collins, Andrea Cossu, Gary A. 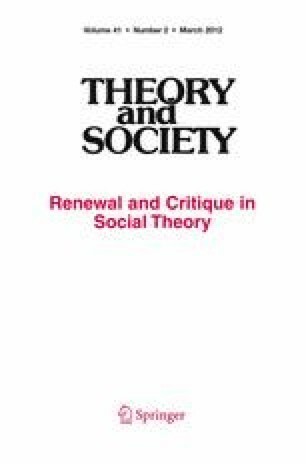 Fine, Neil Gross, Donald G. Jones, Samuel Z. Klausner, Andrea M. Maccarini, Neil McLaughlin, Gianfranco Poggi, Massimo Rosati, Marco Santoro, Giuseppe Sciortino, John Torpey, Isacco Turina, and the Theory and Society reviewers and Editors for their kind help.